The Ministry of Industry and Trade officially launched the Earth Hour campaign 2018 in Hanoi on the morning of March 3 with the slogan “Go More Green”. The “Go More Green” campaign looks to encourage the business community and the entire society to undertake energy-saving activities to jointly protect the environment, and deal with climate change, the phenomenon that is affecting the whole globe. Responding to the campaign, people in Hanoi, Ho Chi Minh City, Da Nang city and other cities and provinces nationwide will turn off lights in their homes from 20:30 – 21:30 on March 24. And, many other power-saving activities will be launched at businesses, households, schools, together with competitions and Flashmob performances during March, the month of the campaign. “The act of switching off lights and other unnecessary electric devices during the 60-minute earth hour bears greater significance than showing the figures of power we have saved, it generates an immense impact on how people can change their awareness of saving energy, protecting the environment, and responding to climate change,” said Nguyen Thi Lam Giang, an official in charge of energy saving and sustainable development from the Ministry of Industry and Trade. 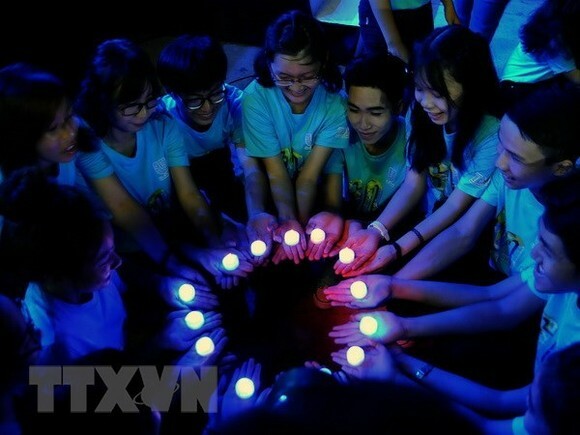 Vietnam first joined the Earth Hour campaign, which is an initiative of WWF, in 2009 as part of efforts to deliver on its commitments to reducing 8 percent of greenhouse emission by 2030 in response to climate change. In 2017, up to 471,000 kWh of electricity was saved during one-hour light off.